Prof. Gopal Krishan Chadha was the first President of the South Asian University. His presidential term lasted from 7 March 2011 to 1 March 2014. Prof. Chadha played a pivotal role in the establishment of the South Asian University, first as the CEO of the SAU Project Office and later as the first President of the university. Backed by an exceptionally brilliant academic record, Prof. Chadha had been engaged in teaching and research for nearly 40 years at Jawahar Lal Nehru University (JNU). He had written 16 books besides contributing 98 research papers to national and international research journals on various development issues relating to India and other developing countries of Asia, notably South-Asia, Indonesia and China. Prof. Chadha was the Vice Chancellor of JNU during 2002-2005 and later a member of the Prime Minister of India's Economic Advisory Council during 2004-2009. During 2007-2008, he was Chairman of the UGC Committee to review the Pay Scales and Service Conditions of University and College Teachers of India. He was a Visiting Fellow at Institute of Development Studies, University of Sussex, England, a Visiting Research Fellow at Institute of Developing Economies, Tokyo, and a Visiting Professor at University of Mauritius. He was an Honorary Professor at Shenzhen University, China and Nihon Fukushi University, Nagoya-Japan besides being a member of the International Advisory Board of the Centre for Development Research, Colombo. Prof. Chadha had been a Consultant to several international development organizations including United Nations agencies such as FAO, ILO, UNCTAD, ESCAP, etc. besides serving on numerous other international and national expert committees. He had been honored with numerous awards and distinctions for his contribution in the field of education including a D. Litt Degree (honoriscausa) conferred by Panjab University, Chandigarh and Mysore University, Mysore, and Doctor of Letters by Pondicherry University, Puducherry. He was elected as the President of the Indian Economic Association. Earlier, he was the President of the Indian Society of Agricultural Economics as well the Indian Society of Labour Economics. Prof. GK Chadha’s life came to an end on 1 March 2014 due to cardiac arrest. His loss was deeply mourned by his colleagues and students at SAU. Condolence messages can be read on the University blog. 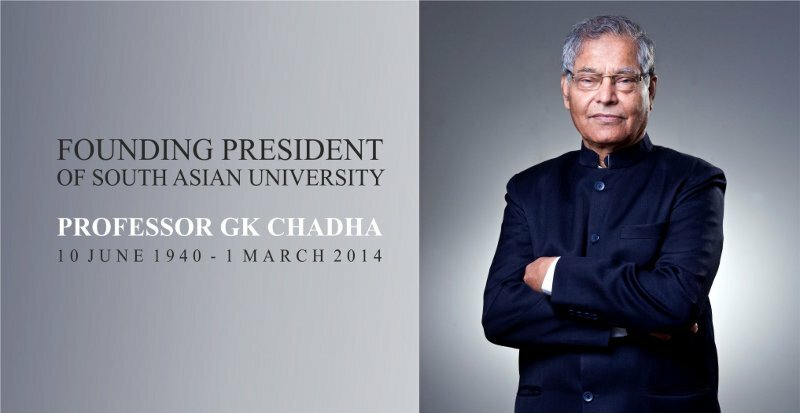 Remembering GK Chadha: A Great Human Being — An obituary for Prof GK Chadha written by Prof Hassan Hameed (Vice Chancellor of the Maldives National University and a Governing Board Member of the SAU).